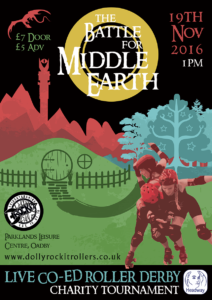 It’s the roller derby event that everyone is Tolkien about! Come and see the biggest Battle of Middle Earth that the Midlands has ever seen. The ring has been awakened, but with only one team to rule them all, which team will it be? Is the time of the elves really over? Will the Orcs rule Middle Earth? Or perhaps the smallest person can change the course of the future. Who will be voted to be part of the MVP Fellowship of the Ring to go through to the final Battle of the Black Gate and defeat Sauron once and for all? Spectators will be involved in choosing the Fellowship MVPs by purchasing votes (all money to go to our Charity Headway). 1 hour MVP Game – top 20 skaters as voted for by the audience, come together to go through to the MVP Exhibition game. Split into two teams of 10, which team will take the win at the Battle of the Black Gate? Profit’s made will go towards supporting LDRR’s Charity of the Year – Headway Leicestershire and Rutland. Intermediate / advanced (5+ bouts), all genders welcome. A brain injury can have a devastating and life changing effect and finding the appropriate support to assist you to adjust to these changes can be difficult. Headway Leicester provides a range of opportunities and support through our activity day service and city and countywide (including Rutland) outreach service. We can offer information and guidance to families and carers at a difficult and uncertain time. The focus of our work is to enable individuals to cope with their changed lives and move forward to achieve their best possible outcome which may include education, employment, voluntary work or independent living skills. 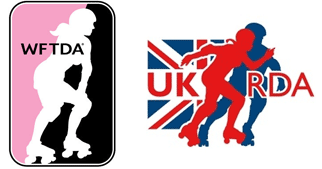 Previous story How do you become a roller girl or referee?